For the first time in some days it was dulling heavily. After a bit of to-ing and fro-ing to establish in which direction to head – we started our final day’s walking. Our route took us first along a country road and then off under a tunnel of trees. 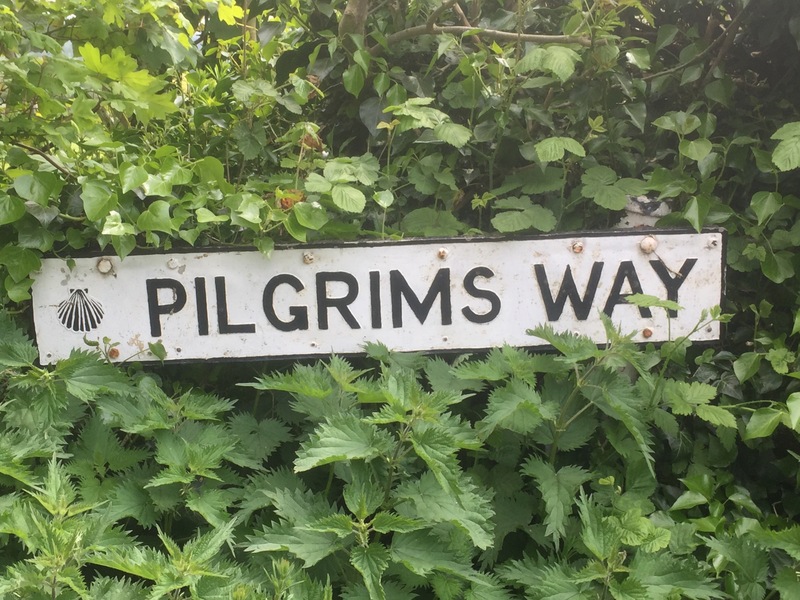 It was another of those paths that made you feel that you should have been up at dawn to take the route to get your eggs to market in Canterbury…….. An ancient walkway. As we came out of the tunnel, we were confronted by the flint walls of Botolph Aluph Church. There is nothing of a village now but the size of the church would seem to indicate quite a large community there at some stage. Crossing the drive to the church we struck out towards the long hill that was Soakham Down which seemed quite an appropriate name given the darkening skies. The skylarks continued to trill – a sound which has been with us since Winchester. The views now are over the Stour valley. We have reached the river which we will ultimately find in Canterbury. The bluebells here are quite faded, but the bracken we saw emerging and tightly curled at the beginning of the walk is now much more advanced and the fresh green fronds have started to dominate the woodland. 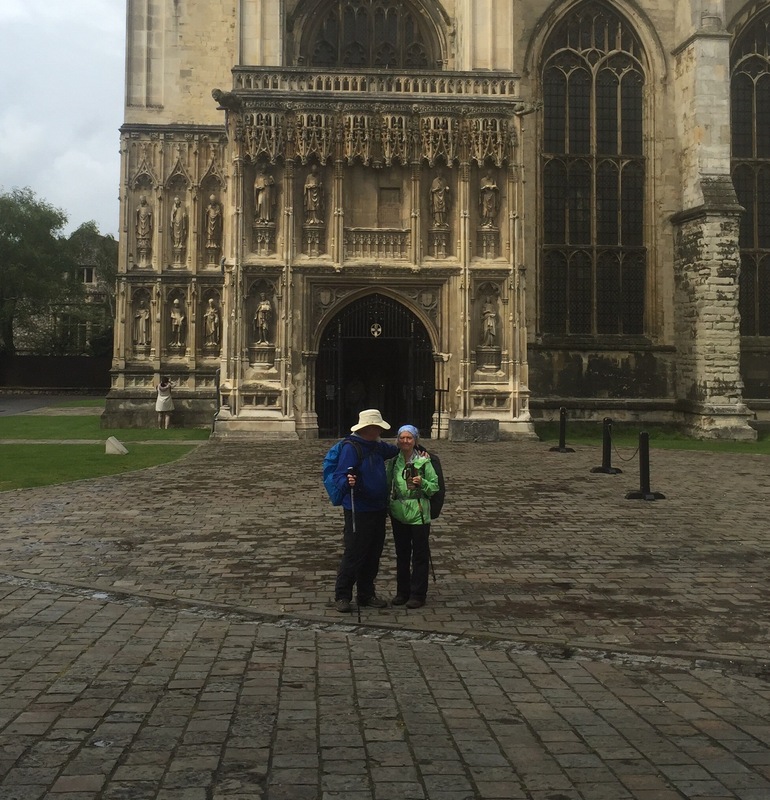 Another milestone appears – this one shows we have just 10 miles to Canterbury. We are nearly there!! A little further along there was an information board talking of an annual pilgrimage that takes place each year from St Martin in the Fields church by Trafalgar Square in London to Canterbury. The board was placed as it was to mark the spot from which they could get their first sighting of the Cathedral. No chance today – all I could see was mist! 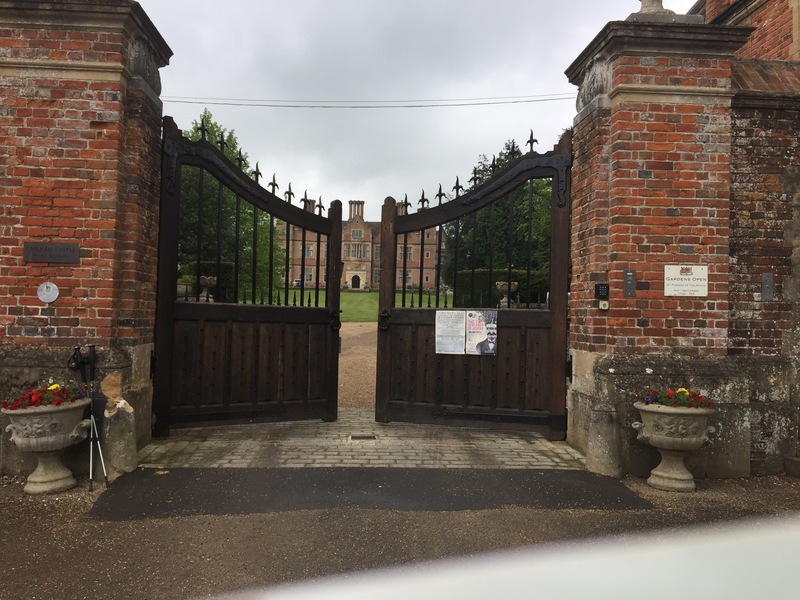 We emerged from the wood onto a country road and after passing some rather wonderful half timbered houses we came to Chilham just as the gates were closing on the castle. 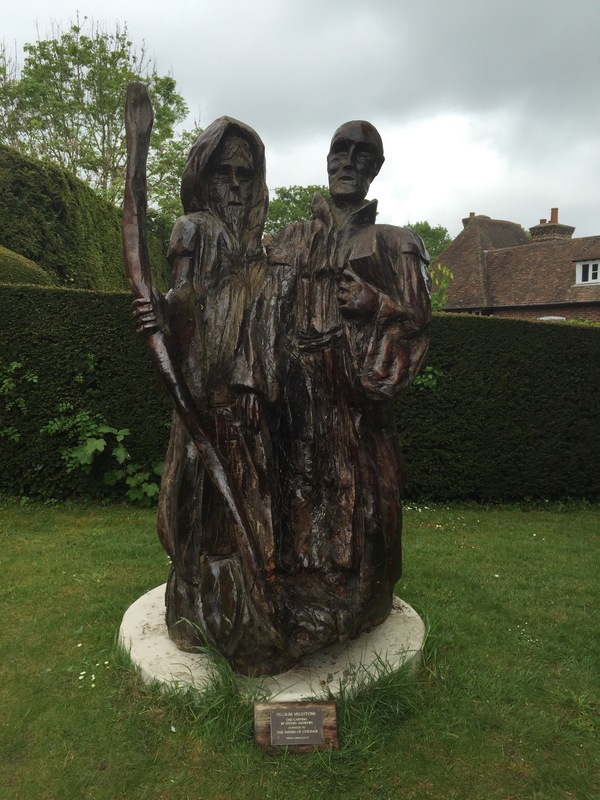 Chilham is a lovely spot and it now sports a pilgrim sculpture that we haven’t seen before. I thought they looked a bit bleak – maybe they have blisters too! As it had by now started to rain in earnest, we decided to take advantage of the tea shop for a drink and a snack. I had the best cheese scone of the journey. When we came out it was pouring so we decided to defer viewing the church (supposedly one of the thousand best churches in England) until another day and press on. We reckoned we probably had another six miles to go. Leaving Chilham behind we became more than aware we were definitely in Kent – we were seeing more oast houses and there were orchards. 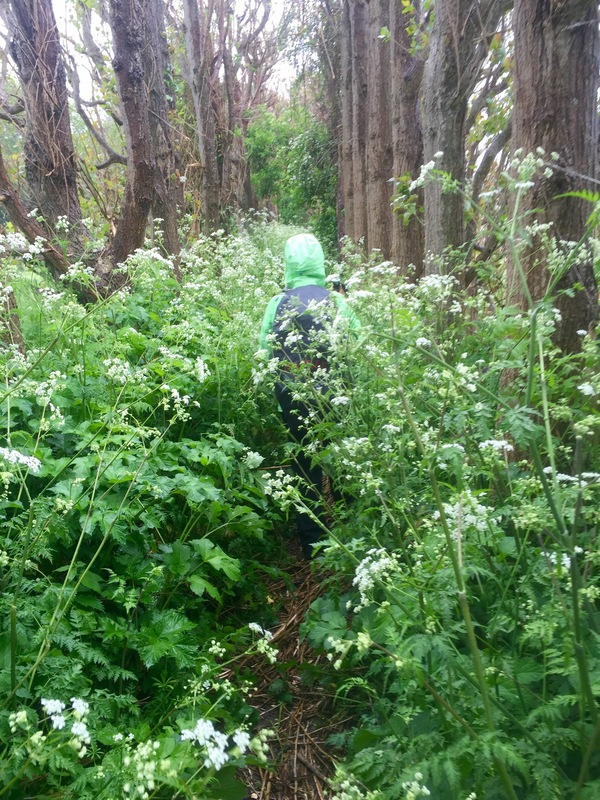 One particularly soaking experience was going through a tree lined path between orchards with cow parsley so high and dense that it completely enclosed the path and rose over my head! It was cold and wet. 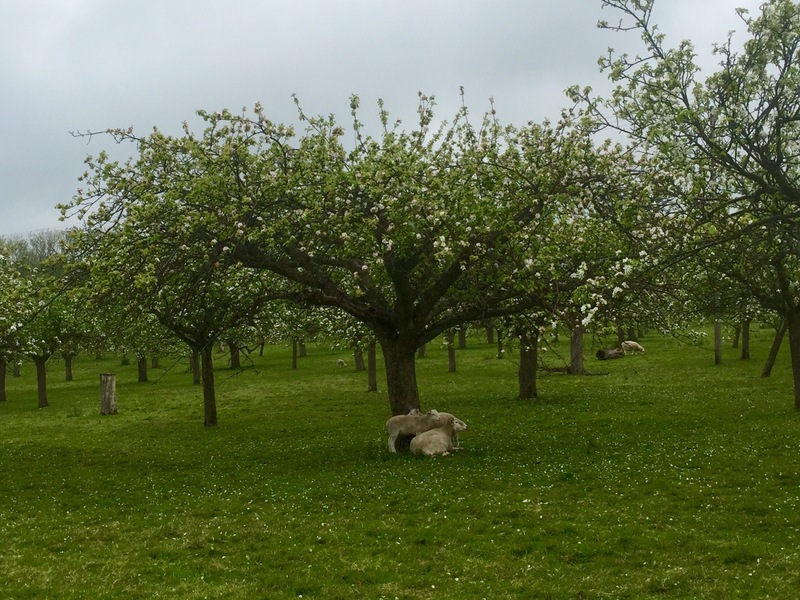 The next orchard was of the old variety with well spaced, blossom covered trees and sheep grazing or more accurately sheltering beneath them. However, a little further along the path we came to a farm with the intensive apple tree approach. Little trees planted not more than a few feet apart. They always look to me as though they can’t breath! The path was now very muddy and a bit slippy as we came down a hill and up the other side where there was almost a village of basic metal mobile homes – obviously accommodation for the army of pickets who will descend on the place in the Autumn. We decided not to take advantage of a seat with a view over the orchards (Roger’s Rest apparently) given that it was still raining heavily. We continued on our way. We eventually left the fruit farm behind and emerged into a pretty garden and continued down the road into Chartham Hatch. Just after passing two particularly nasty oast house conversions, and crossing a playing we came across a community area called No Man’s Orchard. No tight planting here. Just a large number of old English apple varieties growing in lush meadow land. Apparently maintenance costs for the orchard are met from the proceeds of selling the apples. A lovely idea! Not long after this we came to Blean and the site of what is thought to be a Bronze Age fort. The area has been cleared and there was a picture of how it might have looked. Fascinating. All the way along the route there has been a strong sense of treading ancient pathways. I just love it. Soon the sound and eventually the sight of the busy A2 was ahead. Nothing more certain to bring you down to earth! 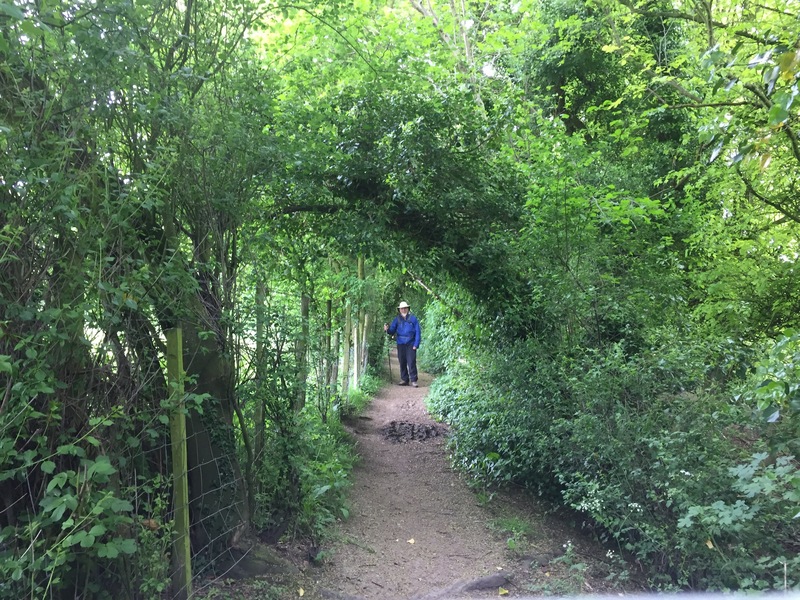 We crossed it on a road bridge and walked along a sunken footpath beside another orchard before crossing a bridge over a stream and then, striking up hill again, arrived at Harbledown on the outside of Canterbury. It is always difficult arriving in a busy urban area after spending time walking in peaceful isolation through countryside. Suddenly we were surrounded by traffic and had hard pavement under our feet. 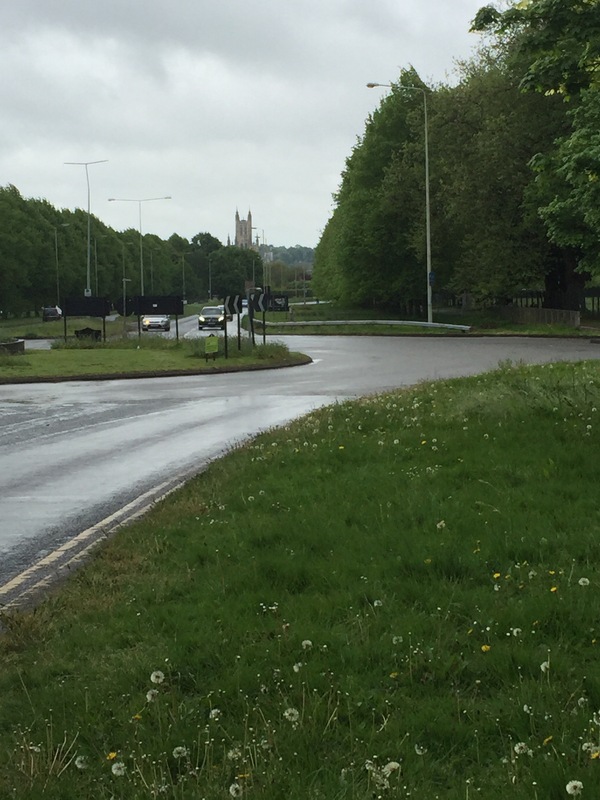 At a roundabout we caught our first view of the Cathedral in the distance. 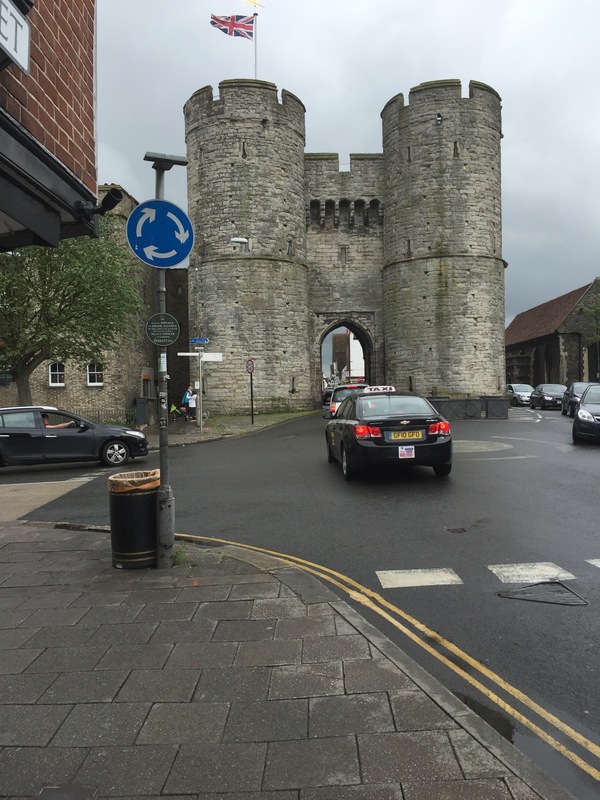 Before long we were walking along the London Road into Canterbury and soon after the West Gate of the City. I found myself quite tired and emotional at this point. We had done it again. We think in total mileage, including leaving and returning to the route, we had walked 150 miles in 12 days without a break. 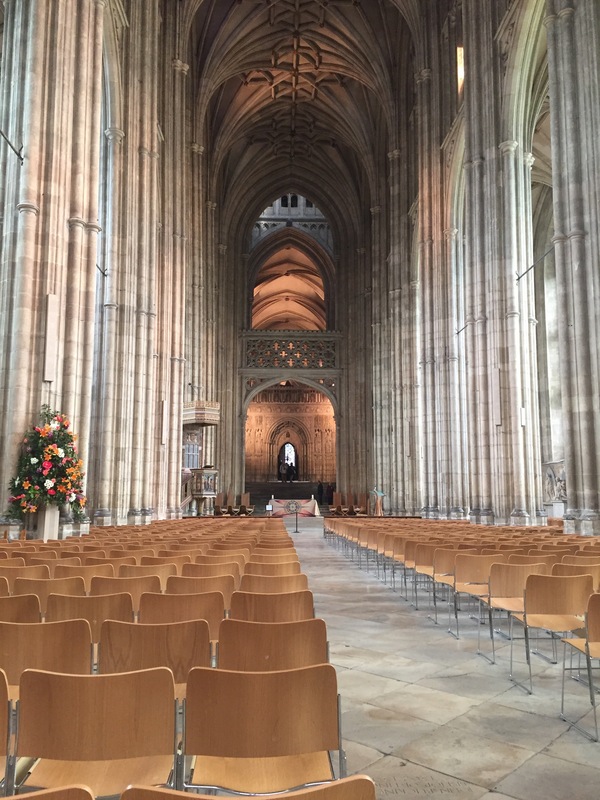 We have had a great journey, the countryside has been beautiful and we have arrived back in Canterbury which seems somehow to have become part of our history. Amen seems appropriate, but I am not sure about the chairs……. Well done to both of you. And following on almost immediately from the Cleveland Way, and impressive achievement. 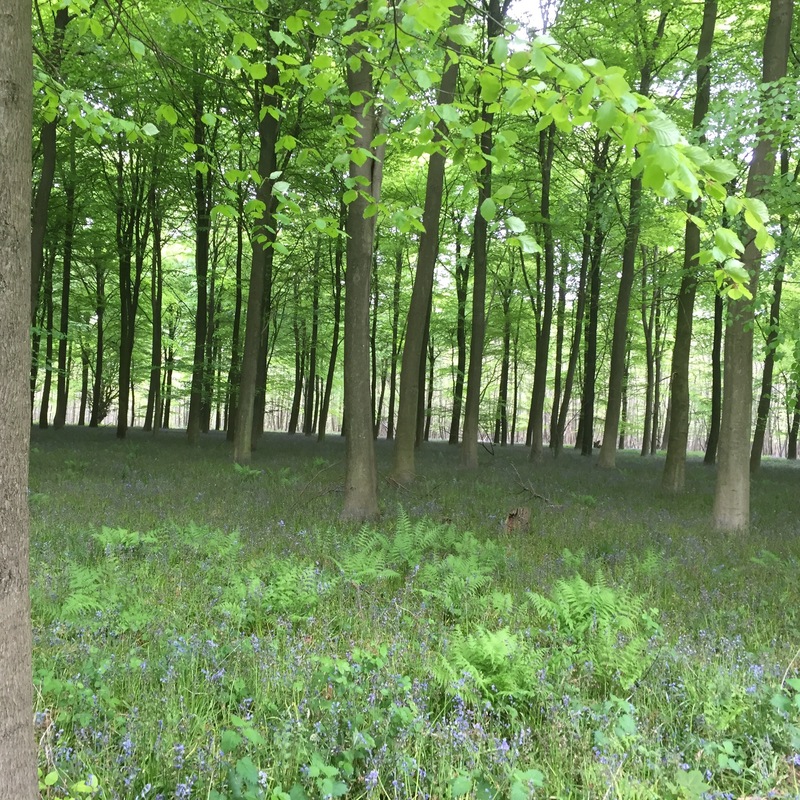 Looking forward to your Yorkshire Wolds Way blog.